The strength and durability of concrete makes it suitable for walls and foundations in homes. Those concrete structures may last for years with little or no maintenance, but they come up short in the aesthetics department when compared to other finish options. Give your concrete walls a makeover with parging, which essentially means covering the concrete with mortar. Parging is similar to applying stucco. 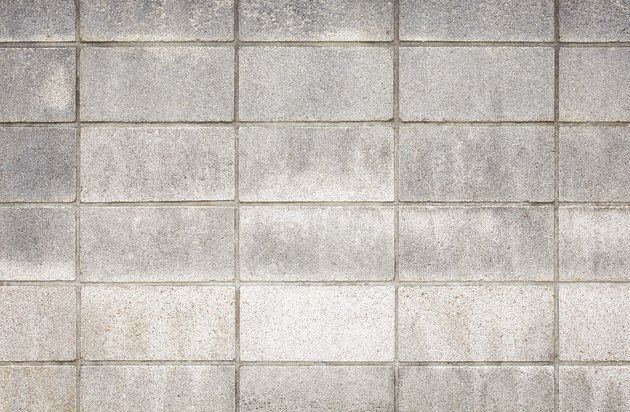 It's a technique that requires some skill and practice, but if you master it, parging helps even out textured concrete, hides cracks and damage, and makes your concrete walls look better. If you want the mortar to last, you need a clean, smooth wall to start. Remove existing mortar drips or clumps by scraping them away using a hammer and chisel. Some loose sections can also be scraped away with a putty knife. You may need to do a few repairs to the wall before you start the parging process. Fill cracks wider than 1/4 inch with mortar. Apply the mortar with a trowel, and let it set before doing anything else. Sweep away dust, sand and debris with a stiff wire brush. Wash the walls using a garden hose and a mild detergent such as dish soap to make sure you remove all of the little pieces. Parging mix sticks to walls better when they're free of dirt and debris. When applying parging over painted walls, coat the walls with a bonding agent before you begin. This bonding agent will help the mortar bond more successfully with the painted surface. With the walls prepped and clean, you're ready to stir up your parging mix. You can find the parging mix at your local hardware store. While most parging mixes contain only Portland cement, sand and lime, it can be difficult for novice installers to mix these ingredients in the correct proportions to ensure a successful installation. Premade parging mixes take the guesswork out of the proportions and can greatly reduce the risk of problems with your finished walls. Blend your parging mix with water according to the instructions on the package. If you blend it correctly, the mixture should form a thick paste. If it's overly wet or runny, you'll need to add more mix until it reaches a thicker consistency. If it's too thick, you may need to add a little water. You have the option of creating a smooth or textured surface as you apply the parging mix with a trowel. Decide which option you prefer before you start working. Apply the mortar mixture to a moistened wall. Keep the first layer no thicker than 3/8-inch. Use your trowel to create the desired surface texture, whether you smooth it out or create a textured appearance. Scratch the surface with a plasterer's rake or broom to create a rough texture. The wall needs to dry for 24 hours before you apply the second coat, which should also be no more than 3/8-inch thick. A second coat isn't required. Skip the second coat if you are happy with the appearance of the wall after only one coat. Mist the wall with water periodically over the next five days. This helps the layers dry more slowly, which can reduce the risk of cracking or flaking over time.